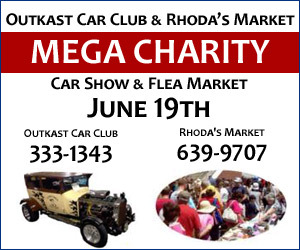 The Outkast Car Club & Rhoda’s Market Mega Charity Car Show and Flea Market host a Mega Charity Car Show and Flea Market this Sunday June 19th, 2016. The show runs from 10 am – 4 pm at the Saint John Airport in support of PRO Kids. Romero House and the Saint John SPCA Animal Rescue. Bring Dad out for a good time on Father’s Day at the Saint John Airport! There will be live music with Scott Medford and the Instigators, Children’s Games, Aircraft Static Display, Saint John Flying Club and Saint John Flight Simulator Club Exhibits, BBQ, water, cotton candy, popcorn, 50/50 and other draws, hamburgers, hot dogs, soft drinks, pizza.